HomeStone-HeartI Love You - My Sweet StoneHeart! I sometimes go a little freaky and make crazy things like this. This is one of my arts on stone which I did some years back - of course during my renaissance year of painting to be precise. Life was full of wonder then and I must have been one of the top person at wondering during those good old days. I might have been very mysterious for others but I was very simple and honest for myself. I was an introvert and used to plunge into thinking about the world when others used to enjoy the company of friends and were very frank. Most of them had an extrovert personality unlike me. So, as an introvert it was obvious that I had no sweetheart. Guess what I came up with? Yes, I was a little less creative than Bramha, a Hindu God known as the creator of this universe, and therefore I could just make a stone-heart. 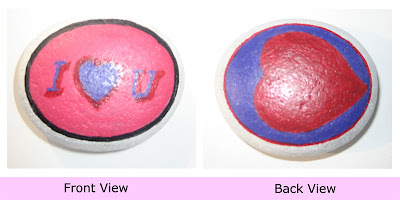 It was a cute idea to paint on stones. Not to mention that I want to try every things I come to know of. I have that instinct now and I had that instinct then. Either I had acquired that instinct from the environment I grew up on or I had got it integrated directly into my genes is hard to say. However, I think the latter one must have been the case with me. Whatever, the result is that I am very curious and want to do all the things which I find amusing. 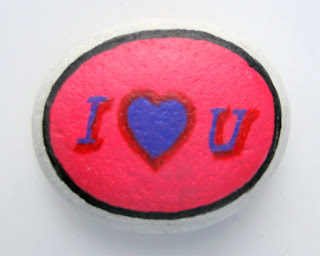 Painting on stones was certainly among one of the coolest idea and I did it! There are many things at which I believe that I qualify nomination for Nobel prizes, and imagination is one of those things. I don't mean to say that I was good at imagination by the idea of painting on a stone - this idea wasn't unique. Here, I mean to say that I used to imagine and daydream a lot. Yes, I was a good daydreamer who didn't spare the night as well - that means I worked "overtime" at daydreaming! And as the story of the good old days continues, I had sweethearts in my mind, carefully chosen, and secretly loved so as not to let others get a clue on the matter. I hope I had been successful. I dare not to name those whom I used to love back then because that will make a long list - they were not one, not two, not three, but many and one of the interesting notice I have made about girls is that most of the girls whom I want to talk to get the impression that I am in love with them but those whom I like are the ones to whom I actually can't even say a word and are often among the ones whom I need to talk to only occasionally and by chance. So, I guess those sweethearts didn't know that they were someone's (hey, this someone is me indeed) sweetheart but I believe that everyone has some mental sweethearts at some point of their life and that's a normal phenomenon. My God! I am normal - at least at one thing. A little work on Photoshop. "Flash On" while shooting resulted the "Glow". I told you my story all the way and nearly forgot my purpose. 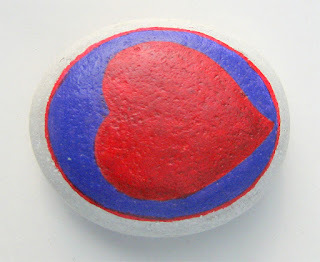 I was here just to say that I really love this "Stone-Heart" - that's what I want to call it - which I made myself when I was studying in grade nine and that I now want to share it with you, thanks to the digital technology which made it not only possible but really very simple as well. So, how is it? Please have your say in the comments below.